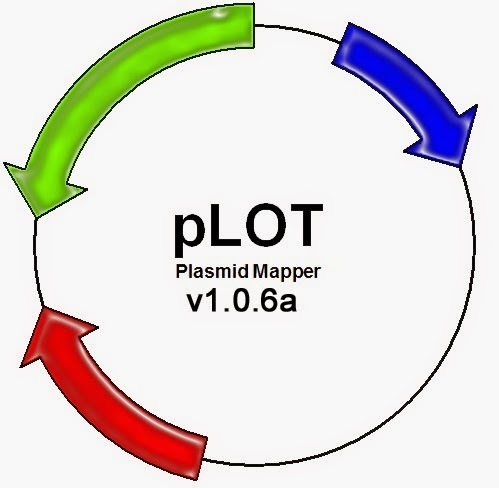 pLOT 1.0.6a is out. This patch adds two NEB PFGE ladders for the virtual gels and includes a few minor fixes. The mouse icon changes when hovering over a feature or label. It seems there was an error occurring when a new sequence was entered. This is now fixed in this patch. Apologies for the issue. Version 1.0.5b is a minor update that changes the spacing in the circular map to a more evenly spaced form where groups of labels are more centered on the middle of the group. It also fixes a bug that occurred sometimes when only a single label was being drawn on the linear map. Fixes a bug that caused enzymes to not be shown after a gel is displayed. Linear plots now show labels written vertically and spaced correctly as opposed to the previous, uglier horizontal texts. See image below! 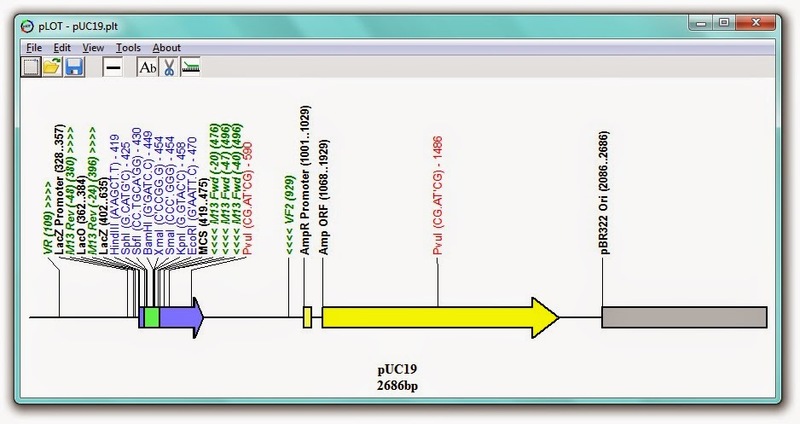 Since some annotated sequences are short relative to the whole sequence and thus don't take up much space on the map, clicking on them can be difficult at times. Additionally, annotations behind others cannot be clicked on either. To fix this, labels for annotations are now clickable and bring up the same options/menus/etc... as if you had clicked on the feature itself on the map. Many thanks to my fellow labmate "NL" for this suggestion. There is still a FloodFill bug where most of the map will get colored if you view a linear sequence where an arrow graphic spans the origin. I'm not thrilled with the spacing of labels in the circular map and will be implementing a change soon to make the spacing more even. Editing base pairs through the edit menu can result in shifts in the sequence without shifting the bp at which annotations begin. This will be fixed shortly but it is recommended that you do not use this feature to add or subtract base pairs from the sequence, simply to change existing ones. Use the "Insert/Delete Sequence" from the Edit-> Sequence menu. As always, feel free to like the pLOT Facebook Page for up-to-date information on new releases, to report bugs, or to suggest new features. pLOT version 1.0.5a is set to come out soon (before the weekend at the latest, probably in a day or two). This patch changes the text direction in linear plots from the previous horizontal form (which was ugly, imho) to vertical. Because some short-sequence features can take up very little space, clicking on them can be challenging in some situations. To solve this, clicking the labels for the annotated feature will now do the same thing as if you clicked on the feature itself. My thanks to my fellow labbie "NL" who made this suggestion! As always, feel free to like the pLOT Facebook Page for up-to-date information on new releases, to report bugs, or to suggest new features.